Kevin Hart has made a name for himself as one of the foremost comedians, entertainers, authors and businessmen in the industry today. Currently, he is on a world tour doing standup with his newest hour of material, titled The Kevin Hart: Irresponsible Tour. Up next is Hart's feature film Night School, which he co-wrote, produces and stars in—all under his HartBeat production banner. 2017 was a banner year for Hart. His memoir, I Can't Make This Up: Life Lessons, debuted at #1 on the New York Times Best Sellers list and remained on the list for 10 consecutive weeks. The book topped records on the Audible platform, selling over 100,000 copies in the first five weeks. Hart also starred in the reboot of the classic film Jumanji, which has grossed over $900 million at the box office and has become Sony Pictures' highest-grossing domestic film of all time. Hart's digital platform and streaming video service, the Laugh Out Loud Network, has been downloaded 800,000 times in the first year. The app features a slate of original scripted and unscripted comedy series, stand-up specials, licensed programming and live broadcasts. Laugh Out Loud combines Hart's unparalleled social media savvy that earned him 100+ million followers with his vision for the future of comedy: Social, mobile, multicultural, and seriously funny. Hart's feature film credits include The Secret Life of Pets, Central Intelligence, Ride Along and Ride Along 2, The Wedding Ringer, Get Hard, About Last Night, and Think Like A Man, among others. 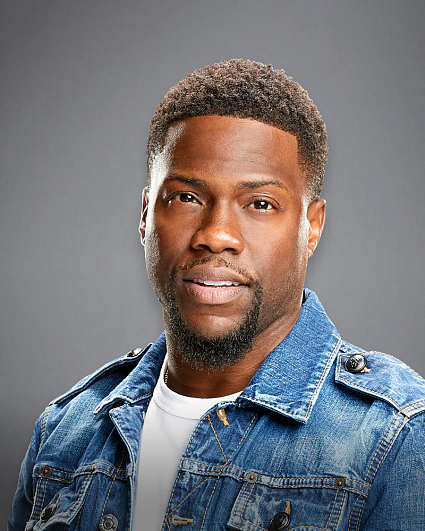 Hart is also a force in television, launching the stand-up comedy series Kevin Hart Presents: Hart of the City and executive producing Real Husbands of Hollywood. Currently, Hart resides in Los Angeles. Follow him on Twitter and Instagram @KevinHart4real.